The Joy of English Cooking! 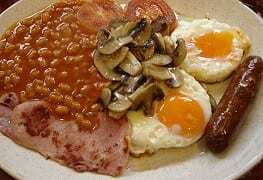 No surprise, you’ve heard all the stereo type about English food: its bland, its fried, its well, Its English! The UK really is trying to shake that stereo type and there are great chefs and gourmet restaurants and a food awakening in jolly old England, And in some parts, they are really getting it figured out. We had some of the best Thai food I’ve ever had in my life in London. Oh wait, but that’s not English food, that’s because the Thai chefs were cooking! hmmm that’s true. The Indian food in the UK is Awesome and wow hot! nothing bland there. Oh but that is because the Indians are cooking not the British. And yet, the Brits LOVE their Indian food the way Californians love their Mexican food. Ok, so for the most part, the stereo type English food is well, just “ok” and very bland with no Wow factor. So my question is? Brits love Indian food for all its spices and heat, then why don’t they cook like that in their food? We did find some REALLY good new food coming out of areas around Windsor in the country, North of London -there are some great restaurants. In fact, this is becoming the foodie area and people come from London to eat at the new restaurants and 5* chefs are opening up and creating super creative dishes. Manchester has a small chain of private owned restaurants called The Botanists that the food was Wonderful. But overall, I don’t quite get why England does continue having just “ok” food still. And of course don’t get me started on any menus having ORGANIC food on the menu, it just doesn’t happen ever! My quest continues to find consistent good food and we’ll let you know as we post areas we are traveling, where we find that good tasty food. The good news is, the best quaint pubs that are old old always serve a great Pint so the meal isn’t totally lost with gorgeous atmosphere and a steady pint to quench your hunger!